He was never found And the criminal responsible disappeared along with him Though the trail is long cold, the ones left behind to grieve still hope for closure. Everyone who visits the town of Firebend hears about Wyvern As the most popular, most interesting server at the town’s only tavern, he can’t help but be noticed It’s his striking, dark good looks It’s his charismatic, friendly nature It’s the freaking huge mechanical wings attached to his back Everyone wants to be near him, but Wyvern wishes that he wasn’t such an object of fascination He already has about as much attention as he can tolerate. 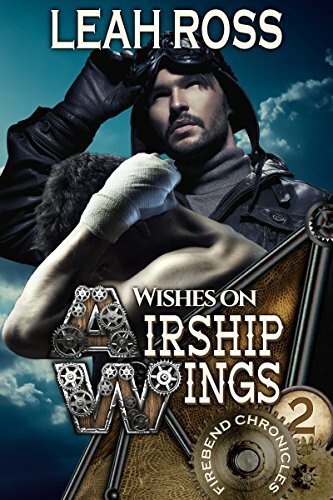 Wes Sterling is a celebrity among Fringers, captain of the uniquely beautiful airship the Sterling Wish After months of going town to town and shaking the hand of practically every Fringer in existence, he’s ready for some down time to rest and make repairs Firebend is as good a place as any He doesn’t expect to find the solution to his mechanical problems there, and he definitely doesn’t expect to fall in love. Attraction won’t be enough to bring Wyvern and Wes together Not even love is strong enough to overcome the barriers between them All around them hover the specters of Wyvern’s personal demons—past and present, real and imagined If they can’t unite to vanquish the fear that’s plaguing them, then they’ll lose so much more than they ever thought they’d gain.